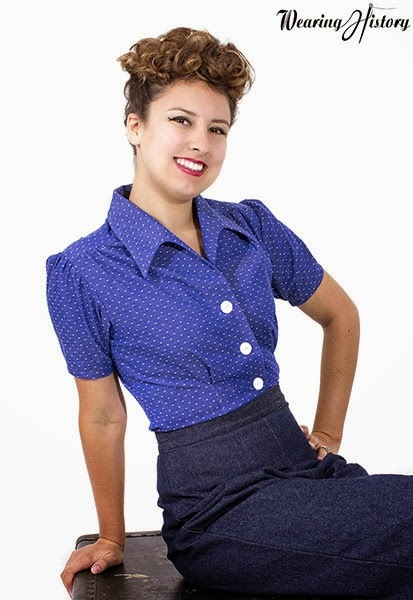 Wearing History has become a much-loved pattern collection for vintage sewists but Lauren has taken her love of fashion history even further to launch her first ready-to-wear line, now available for pre-order! For those who love Lauren's patterns but don't sew (or do, but also love a quality made piece), this collection is a fantastic alternative to sewing your own. The Wearing History of California label begins with 5 pieces, reflecting the many beautiful styles from her pattern collections. Including 2 blouses, 2 dresses and 1940s ladies trousers. 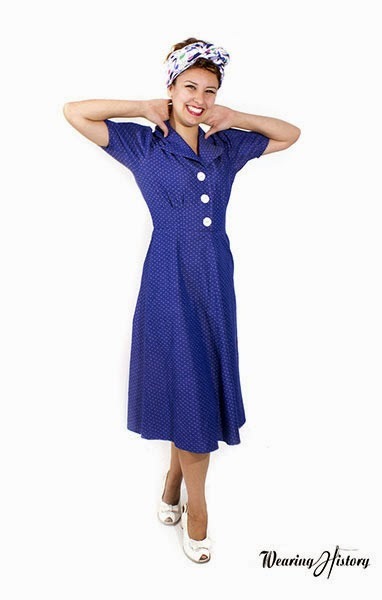 Wearing History clothing is a business operating on the homefront- designed and manufactured in the US, with fabrics custom dyed and printed also in the US. Lauren is beginning this project with a bang, focusing all over her attention on the details. 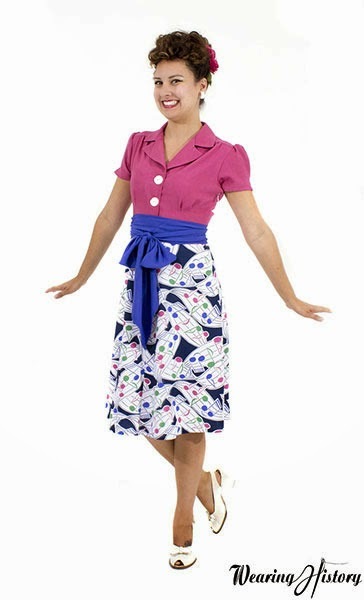 The 1940s novelty "Melody" print is exclusively made for Wearing History. The white deco buttons were hand-selected by Lauren for their authentic look and imported from Germany. All of these beautiful pieces are available to pre-order through the Wearing History Kickstarter campaign. Plus Sizes, Jeans, Sweaters- Oh my! Right now, Wearing History must raise $15,000 just to begin the manufacturing process. In just 5 short days, they have reached 2/3 of their goal!! If Wearing History can reach $5,000 or more beyond the initial goal, Lauren can use the funds to expand the line for larger sizes with plus sized dress forms. 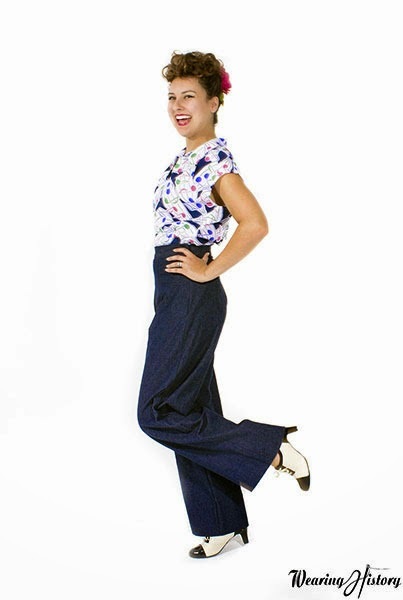 Lauren hopes to add menswear, womens' jeans, sweaters and more amazing vintage clothing available for our community! 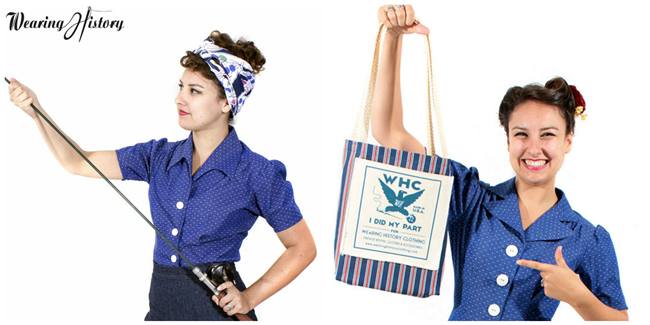 Lauren has set up several wonderful thank you gifts for those who pledge, including exclusive tote bags, deals on Wearing History sewing pattern packs, Melody print turbans, clothing and personal vintage adventures with Lauren. 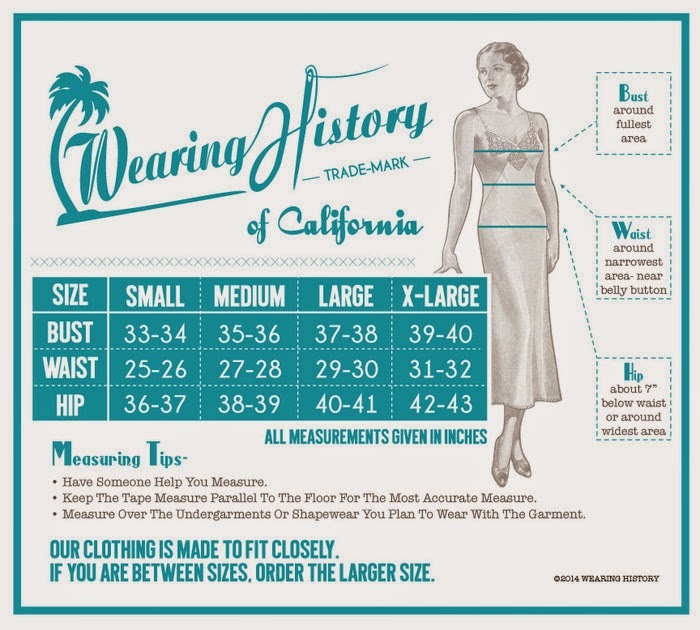 So please check out the Wearing History Kickstarter campaign to give your support and pledge. 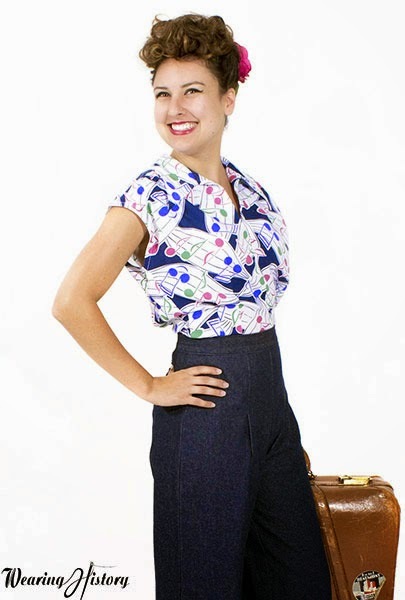 Wearing History is a sponsor of Va-Voom Vintage. 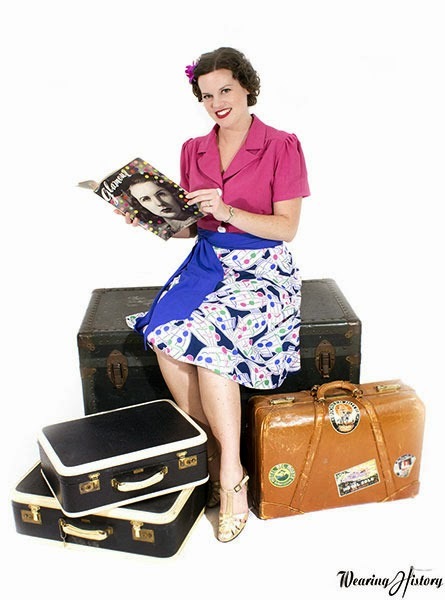 To advertise your business on Va-Voom Vintage, please see my sponsorship page. I can't doff my hat enough in Lauren's direction. This is such a big, inspiring, awesome thing to undertake. I wish her all the luck in the world and very much hope to be a customer one day when the ol' budget can swing it.